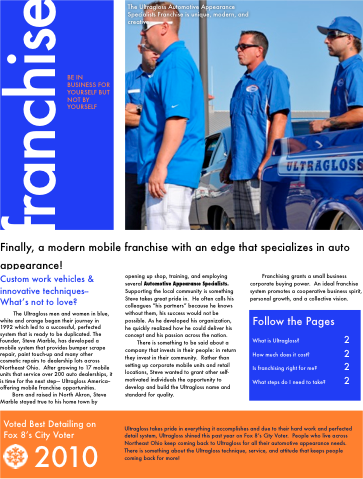 Ultragloss will be showcasing their automotive franchise opportunity this weekend at Franchise & Business Opportunities Expo in Cincinnati, Ohio. Get Free Entry Here! If you are looking to go into business for yourself, this is the perfect show for you. You can not only examine existing opportunities, but attend seminars and learn more about starting your own business. Perhaps you have a few industries you are considering moving into. This franchise and business opportunities show has a variety industries in one location. Take some time and explore the options available to you. Learn more from experienced business owners and their industries. What do I need to know before buying a franchise? How to Access Capital with SBA Assistance.